Beach Boardwalk | Kids in T.O. I almost forget that I’m in Toronto when I’m strolling along the boardwalk in The Beach (or The Beaches) neighbourhood in the city’s east end. The year-round activities for families along this 1.2 km wood-planked path following Lake Ontario are easy and endless. Here are our top ten reasons to stop along the way. 1 – Sand and stones – It is a beach after all. In fact, two beaches border the boardwalk – Woodbine (running east and west from Woodbine Ave) and Kew-Balmy (located between Silver Birch and Leuty avenues.) They offer up three-kilometers of sand, rocks and a combo of. For the best sand castle sand, dig in at Ashbridges Bay Park on the west end. You’ll find quite a few more rocks eastward. Great for stone skipping and rock collecting. We’ve often come across a series of inuksuks. 4 – Take in the view – There are lots of spots to stop and admire the view. The Leuty Lifesaving Station (built in 1921) is an icon of the eastern beaches. On a clear day you can see a faint skyline on the other side of Lake Ontario. More exercise, stop for a few chin ups the bars and rings. 5 – Picnic – Lots of space for snacking on the grass north of the boardwalk. Some areas closer to Woodbine Bathing Station have BBQs. 7 – Dog watching – Chances are you’ll be sharing the area with lots of dog-owners out for a stroll along the boardwalk and a run in one of the designated off-leash areas. There is a gated off-leash dog area south of Kew Gardens at the foot of Lee Avenue and another at Silver Birch Park from Silverbirch Ave. to the foot of Nursewood Rd. 8 – Swim – Eww, you say? Don’t be shocked when you see people enjoying the waters along this stretch of Lake Ontario. 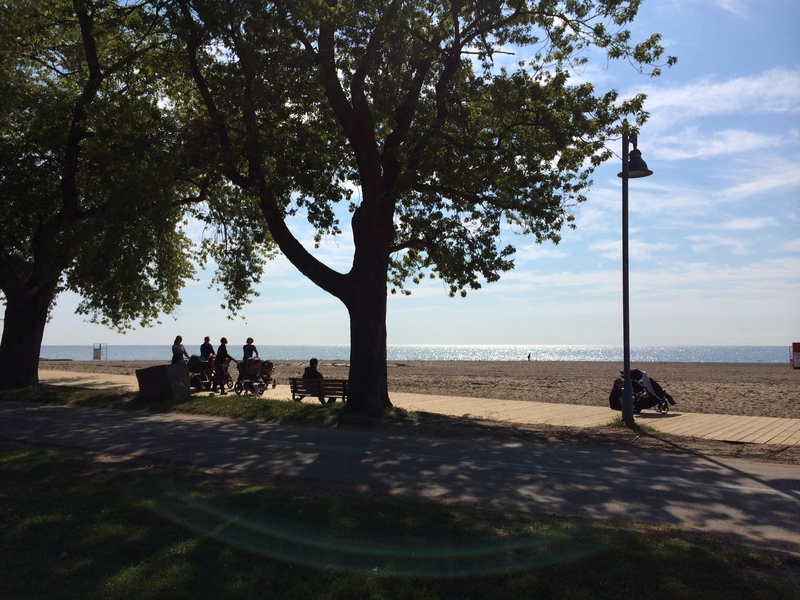 For almost 10 years, Woodbine and Kew Balmy Beaches have been recognized under the international Blue Flag program. Each year they are reassessed to meet all the requirements. From June to August, the City’s beaches are tested for water quality (and are staffed by lifeguards) and if the E. coli levels in beach water are high, Toronto Public Health will post signs warning against swimming. There is also an app for that. 10 – Balls – Bring your own or watch the pros. There is some serious volleyball played at Woodbine Beach and lawn bowling at the Kew Beach Lawn Bowling Club on Lee Ave.
Getting there: Driving, paid parking along Queen St. E. ($2.25/hr) and two Green P lots at Ashbridges Bay ($1.50/hr). Free residential parking if you can find it. By TTC, head into this hood via the Queen St. Streetcar or buses 22A Coxwell, 64 Main and 92 Woodbine South routes. Potty time: Not a lot of stops but on the eastend, try the Woodbine Bathing Station or the building at the Donald D. Summerville Outdoor Olympic Pool. Farther east there is a snack bar at the Balmy Beach Club. Events: For some community events check out the listing on Beaches Living. Food: There is a full-service restaurant in Ashbridge’s Bay Park. Or head to Queen St. E for tons of restaurant options. In the hood: Woodbine Park has a great little splash pad north of Lakeshore Blvd. We can’t wait to try out Ashbridge’s Bay Skate Park once we’re solid on two wheels. If you made it this far – please leave a reply with your favourite family beach activity.